eventually to other locations in Ireland. These streets, which have only a single lane and no separated cycle lane, are common across Europe. 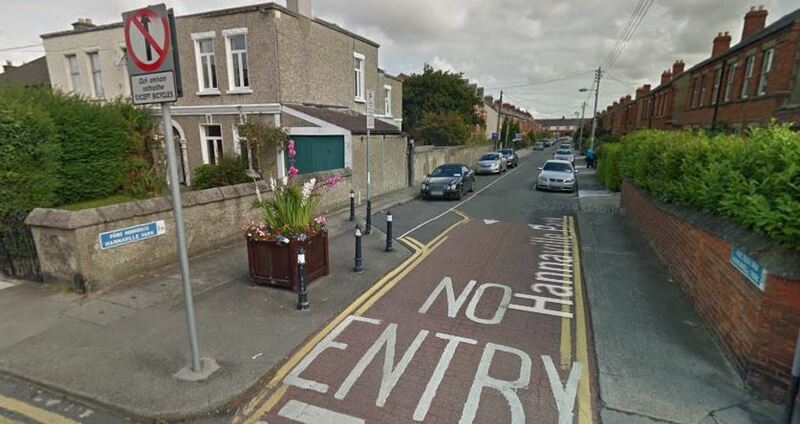 One new example was put in place last week in Phibsborough, it follows at least three examples which were put in place in Dublin around 15 to 20 years ago. 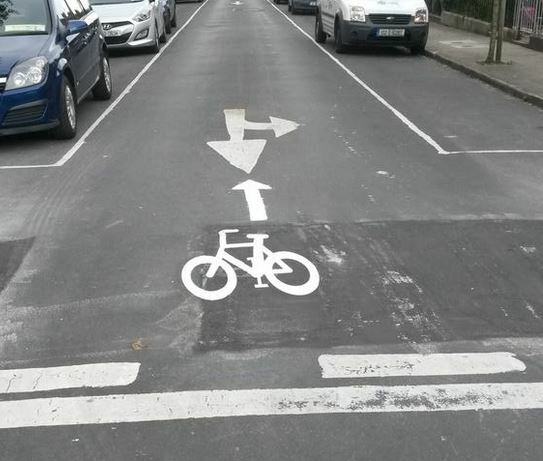 Dublin City Council are now looking at expanding the use of the measure and using clearer markings to warn motorists that bicycles are legally allowed to be cycled in both directions on these streets. 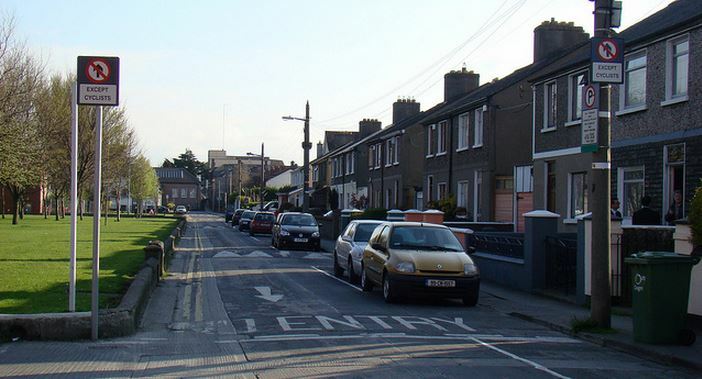 The newest redesigned street is Leinster Street North in Phibsborough, a residential one-way street off the Phibsborough Road. The design was changed on Wednesday night to be two-way for cycling. New bicycle markings and contra-flow arrows were added along the street surface and the road signs were changed to include an ‘except cyclists’ plate under the no entry signs. Dublin City Council are looking to develop a standard design for these kinds of streets and are seeking feedback, which can be sent to traffic@dublincity.ie. 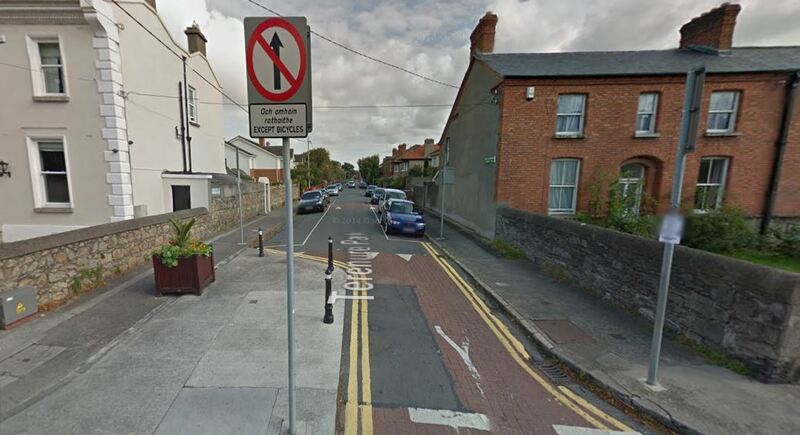 Phibsborough is also host to what is likely the most popular of the three contra-flow cycling streets which have been in place for years. On the other side of the Phibsborough Road, another residential street, called ‘Royal Canal Bank’ is used as a cycling bypass of the congested Doyle’s Corner junction in Phibsborough. A 2013 survey of city and county Dublin councillors found that there was high support for these contra-flow cycling streets. When shown the Royal Canal Bank example and told that these arrangements are used in Berlin, Paris, Amsterdam and Copenhagen, nearly 80% of councillors who responded said that they would support wider use of the design across Dublin on low-speed residential and shopping streets. Meanwhile, on larger and busier one-way streets, segregated lanes or paths are seen as a requirement for legal contra-flow cycling. Dublin City Council in 2010 had a plan to roll out contra-flow cycle paths or lanes to more than ten areas across the city but, five years later, there has been no visible progress on that plan. The delay was partly linked to planned and now underway Luas Cross City works, as well as the shelved Metro North project. There was also opposition from a small number of councillors. Dublin City Council has since completed a small amount of work on older contra-flow paths and lanes to make them more usable or clearer to motorists. As part of this process, however, an unfinished contra-flow route on St Stephens Green West was officially closed off with signs ordering people not to continue the short distance to the bottom of Grafton Street. Elsewhere in Co Dublin, Dun Laoghaire-Rathdown County Council have implemented at least three contra-flow cycle paths in recent years, while in the rest of the country Cork City Council has installed a number of contra-flow cycle paths across its city, and Waterford City and County Council plans to do the same. There is also a contre flow in Marino behind Marino Mart I think it is Haverty Road . You turn left at the CBS School then right up a one way street. The only problem is Locals just ignore this one way Street and drive up it even though it is Illegal to do so. There is two signs saying it is Illegal to drive up it save for Cyclists, but this is ignored. Could do with a contre flow Cycle Lane on Killarney St up to the Five Lamps , very handy . Good to see City Council taking the initiative, even though it is (ridiculously!) technically not signed into traffic law here in Ireland! @ Colm — the examples in Royal Canal Bank, Hannaville Park and Terenure Park are all covered under the same legislation as bus / access / etc only streets (ie the top of O’Connell St, Frederick Street North etc). These are not technically one way streets but practally have the same effect with entry barred to only bicycle/buses/whatever and, with smaller streets like the ones pictured above, no or limited chances to turn the other way for motorists. The entry on the new example seems to be the same as the older ones (with Irish added in). But there is a case for everything to be cleaned up and standardised — the on-carrageway markings codified, use of the new-style no-entry signs with the except cyclist plates, except cyclist plates on the non-contra-flow end, and warning signs for t-junctions intersecting any contra-flow streets. A problem with the Royal Canal Bank contra-flow is that there is no signage or road marking at the NCR end warning motorists that they are likely to encounter cyclists coming towards them. As a result, many motorists assume that it’s a case of cyclists ignoring the laws again and some give very little room to cyclists legally cycling towards them. I agree with Liam. Royal Canal Bank signage is an important development for cyclists as are the new contra-flow markings on Leinster St – both a welcome departure from FCN approaches. The ideas are good but proper signage at both ends is essential. Otherwise, cyclists run greater risk as it is not clear that they are behaving ‘legally’ and I imagine that noone has right of way – this requires the promotion of a culture of respect especially for vulnerable road users (cyclists, pedestrians, children and older people) but also mutual respect between cyclists and motorists – and indeed pedestrians. Things are starting to look better. Larkhill road would be a good candidate for this also, to allow cyclists in from Swords road.